Bookride: Clive Cussler. 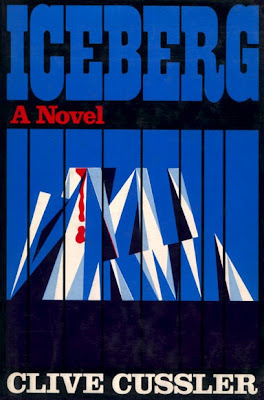 Iceberg, 1975. 'Just seventy-two hours ago Dirk Pitt was lying in the hot California sun with a beautiful woman, a Scotch on the rocks in one hand, but an urgent call from Admiral James Sandecker, his commander at the National Underwater and Marine Agency (NUMA), has brought Pitt out of the warm Pacific breezes and straight into a North Atlantic deep freeze. The reason: the discovery of a long-missing luxury yacht, en route to a secret White House rendezvous, frozen solid in a million-ton tombstone of ice..."
Clive Cussler. ICEBERG. Dodd, Mead, NY 1975. Cussler's second novel and the first in hardback. An ocean adventure thriller featuring Major Dirk Pitt. An ebay special and with 5000 printed there is usually one on there, although it is said that many went to libraries. He has a customer base most authors would die for and there are 70 wants for this book at ABE alone, mostly people hoping for that elusive fine copy at a bearable price in which case they have to be fast to the draw. CC is so popular that one website proudly proclaims that it is the 'number one Clive Cussler website in the world.' This is the 'Society of Cusslermen' -- you don't mess with them. VALUE? These days it is hard to find a nice first in d/w for less than $1500 and signed fine ones can be double that. Book appears to be rising in value, an indication of collecting trends. An ebay shop featured a fairly decent one at $1565 summer of 06. This sold or vanished. People even charge serious money for Large Print copies, Young Person's editions decimated ex libs and there are some, imho deluded souls, wanting $1000 for the 1996 edition. The 1996 Simon and Schuster re-issue edition can go for $300+ and should have the 10987654321 line to be right, the Book Club edition can make over $200. Thorstein Veblen put forward the creditable notion that men are at their height as consumers and collectors in their 40s and, possibly these days,their 50s. Presumably these are the ones buying Cussler and driving the market. As they age the price will fall unless, as was the case with Bond, a new generation come along waving credit cards. I can't see the ringtone generation going for Major Dirk Pitt when they are at the height of their collecting powers. J. D. Salinger. The Catcher in the Rye. Deep Sea Diving. Robert Henry Davis, 1935. El Morocco Family Album. Zerbe, 1937. Casino Royale (1953) Ian Fleming. Takashi Homma. Tokyo Suburbia, 1998. John Blaine. Danger Below, 1968.